How do I use QuickBooks Shipping Manager with Unify Desktop? You can use QuickBooks Shipping Manager to ship using FedEx, UPS and USPS. For details on QuickBooks Shipping Manager, visit http://quickbooks.intuit.com/product/add_ons/shipping_manager.jhtml. Once you finish shipping using QBSM, you can import the tracking info into Unify Desktop. To be able to do so, first ensure that QBSM is selected for use in the store configuration in the shipping screen. Unify Desktop retrieves shipping information directly from on the transaction (invoice), memo field or from a specific field (other) on the transaction. Note: If the Other field is chosen, then the other field must be enabled on the transaction template within QuickBooks. Unify Desktop is able to retrieve the information from the designated field by looking at matching text which acts as the starting point and then Unify Desktop captures all the information directly after the matching text. Tip #1: The information in the matching text field is case sensitive. Tip #2: It may take a few times to get the matching text just right. To help you, see how QBSM puts the information in the "other" field or on the invoice. Select the Ship menu heading and choose a shipping processor. Go through the process of shipping out the package using QBSM. After the postage and shipping information has been generated, you will encounter a pop-up asking to paste the shipping information to the form. 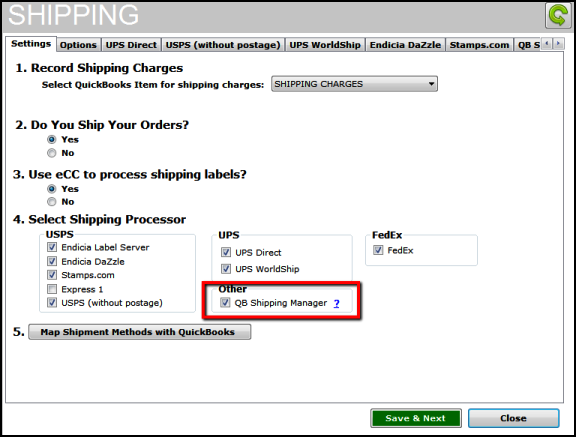 Tip: You should select the option box to do that or the shipping information will not be on the QuickBooks transaction. After the shipment has been generated, QuickBooks will put the shipping information in the "other" field (Sales Receipts or Sale Orders) or directly on the invoice. This shows the tracking information in the "other" field on the QuickBooks transaction. Unify Desktop can retrieve the tracking ID from the field designated in the QBSM setup. In the Inbox, click the Retrieve Tracking ID button to send tracking IDs from QuickBooks to the order in Unify Desktop. This can be done for individual orders or multiple orders at a time. After the tracking IDs are retrieved, the orders in Unify Desktop that were marked as "unshipped" will be automatically as "Shipped" and the shipping processor, method and tracking information will be inserted into the order details. The order can be posted to store to send the shipping information from Unify Desktop to the online store.